Many fats, oil and various foods contain vitamin E. Its antioxidant qualities help prevent damage to your cells and may help slow the progression of Alzheimer's disease. Vitamin E is also essential in the production of red blood cells and helps your metabolism use vitamin K. Adults can get their daily minimum requirement of 12 milligrams of vitamin E by eating a variety of healthy foods, or you can take vitamin E capsules. Vitamin E has no significant effect on preventing heart disease, according to the Maryland University Medical Center. A large study known as the Heart Outcomes Prevention Evaluation was published in January 2000 in "The Lancet." The researchers found that taking a daily dose of 400 international units of vitamin E did nothing to prevent heart disease and strokes. Some proponents of vitamin E as a heart-disease preventative disagree with these findings. Although early studies indicated that vitamin E might offer protection from prostate, colorectal and bladder cancer, it was later found that vitamin E did not have any positive effects on these cancers, according to the American Cancer Society. The cancer society recommends getting your daily supply of vitamin E from foods, rather than from supplements. Vitamin E helps reduce the risk of cataracts and slows macular degeneration, according to the American Optometric Association. Making sure that you get enough daily vitamin E, along with lutein and zeaxanthin, helps prevent cataracts. Taking vitamin E supplements, along with beta-carotene and vitamin C, slows down the symptoms of age-related macular degeneration. A study published in the "Journal of the American Medical Association" in 2014 states that taking daily vitamin E supplements may slow down the degenerative effects of Alzheimer’s disease. 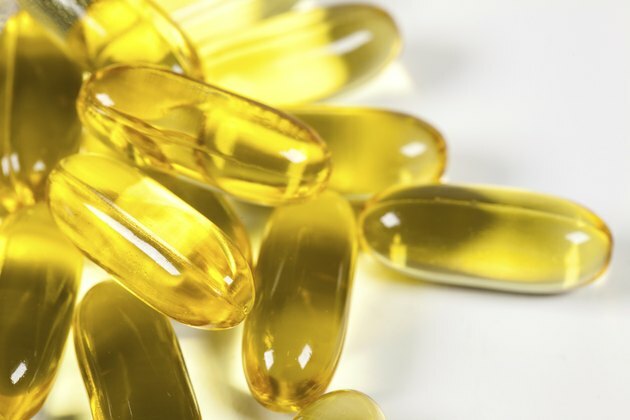 The patients in the study took a 2,000-international unit dose of vitamin E. The people taking vitamin E found a 19 percent decrease in the progression of Alzheimer’s disease. The researchers in this study do not know why vitamin E helped the Alzheimer’s patients. This study used a very high dose of vitamin E, so do not attempt to take this dosage, as it could interact with other medications you are taking. If you do not consume an adequate amount of vitamin E, it can result in adverse health conditions. A vitamin E deficiency causes muscle loss and weakness, vision problems, loss of balance and abnormal eye movement, according to University of Maryland Medical Center. If you plan to get your daily vitamin E with capsules, consult your doctor for the correct dosage. A healthy adult takes about 22 international units or 15 milligrams. Can You Treat Optic Nerve Damage With Vitamins?